Promoting export to the West, the company Orkla Foods Latvija participates in the exhibition The International Food & Drink Event 2017 (IFE 2017), that takes place in London from March 19 to 22. The company presents to the visitors of exhibition the products made in Latvia under brand Spilva – tomato sauces, dressings, mayonnaises, mustards, horseradishes and apple purees. ‘Given the unstable situation in Russian market, we continue to focus on export to the West. According to the chosen strategy, we have decided to participate in the UK’s most important food industry exhibition. For visitors’ evaluation we provide products in several product groups, where main focus we are putting on sauces. 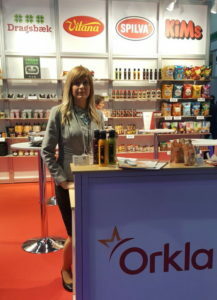 Similarly, we also present apple purees to the United Kingdom market and the exhibition visitors from other countries,’ informs Dana Erciņa-Uzane, Marketing Director of Orkla Foods Latvija. ‘So far we have not felt consequences of Brexit in our exports’ work, and the United Kingdom still is a growing market for us. Therefore, we look optimistically to the planned intentions and results in this country. This year Orkla Foods Latvija plans to increase amount of export in the United Kingdom by 18%,’ says Marketing Director of Orkla Foods Latvija. IFE 2017 is the UK’s largest and most important food and beverage industry exhibition. Its work takes place in nine sections. In the previous exhibition in 2015 there took part 1,350 companies from 57 countries, and it was attended by 29,000 people from 108 countries. Export markets of the company Orkla Foods Latvija are the Canada, Czech Republic, Denmark, Estonia, Finland, Germany, Ireland, Lithuania, Norway, Russia, Slovakia, Sweden, Ukraine, United Kingdom and USA.